12,000 people live in this small town. A town with a population so small the community is close, neighbors are friends and everyone knows everybody. It seems like every other small town you’ll find on the east coast, 4% unemployment rate, 25% of those employed work in manufacturing, the median household income is $51,000 and its overwhelmingly rural and white. Madison is similar to its surrounding states, like Ohio, Illinois and Kentucky; it’s at the center of a drug trafficking triangle that connects Indianapolis, Cincinnati and Louisville. These well known cities are infested with drug related crime rates, high overdose rates and overwhelmed communities of people who have been exhausted with the opioid crisis ravaging their towns. But in another, strange way, Madison is different. In Jefferson County, which has entire population of 32,000, Madison is the highest populated city in the county. The county’s suicide rate in 2016 was 41.8 per 100,000 residents, making it the highest suicide rate in the state, and 3.2 times the national average. Between February 2017 and November 2017, there were 15 confirmed suicides, including four suicides during the week that Madison hosted a suicide awareness walk. A high school administrator one of the dead, who killed himself just a few weeks after submitting a grant to increase the school’s suicide counseling. Many of those suffering with depression have to travel out of town to get help because of the lack of counselors in the city. And Madison is lucky to have a football coach who is stepping in to do just that. 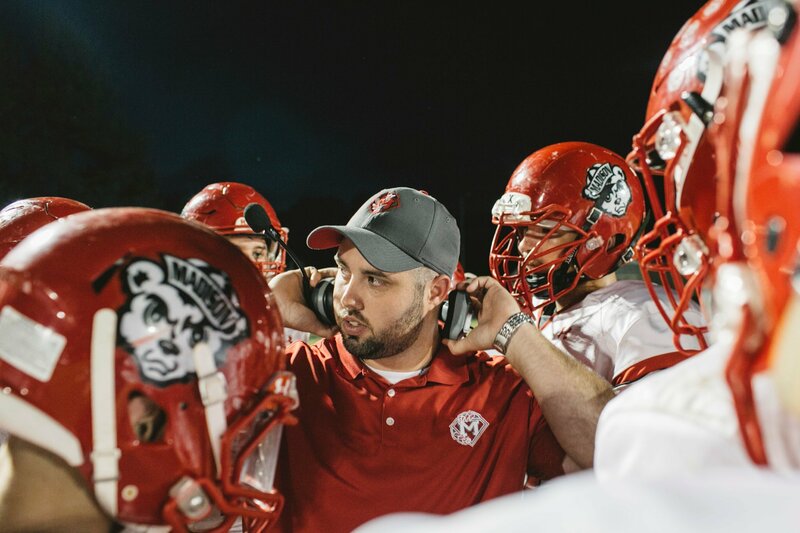 Patric Morrison is the head football coach of the Madison Cubs Football team. He is there for a special reason, and has his own connection to pain that he relates to his players. Patric spoke about his younger brother to his team,” I have this younger brother,” He’s very athletic, very smart. He can show up for a test without even studying and get 100 — somebody who had to be triple-teamed on the football field. I tried to keep him on the right track. His brother was sentenced to nine years in prison. “There’s a whole correlation between him, and me getting this job,” Morrison told his players during that summer speech. “Because of him, I’ve gained 60, 70 younger brothers, and I want to keep you from doing the things he did. Sometimes the coach has to be a taskmaster, sometimes he has to be father figure, but he always has to make sure he can be there for them. Keeping on a trusting basis can help the coach work with the kids while they’re playing on his field. He can speak to them about their future plays and troubles at home. He’s lost star players to their own battles with addiction. It started off as missing practices, then getting suspended and eventually he became a missing person. When he was eventually found and returned to school he was caught with pills. He was supposed to be the starting quarterback, but the towns the sickness got to him too. Madison has lost so many to suicide. Another reason the coach is so aware of what his players are going through. Former players loosing their friends while away in college, present players living along side depressed siblings, parents mourning their children who took their own lives. With no explanation or warning. Students praise their coach for being their rock, and keeping the team distracted while dealing with their own personal troubles. Even though the team was not known for it’s winning record, the teammates didn’t play the game for the glory, they played the game for the support.